Marion Sunset Manor was the fulfillment of a man’s dream. Thomas Clyde Bussey was born and grew up in Alabama. As a young family man he moved his wife, Ruth Ray Bussey and young son, Joe, to Shawnee, Oklahoma seeking a better job. Soon after the move another son, Don, was born to complete the family. For several years Clyde worked in various jobs. Finally he and Ruth were able to own and operate their own business, Bussey’s Grocery. After Joe completed a business degree from OSU he worked in the family grocery store awhile. Clyde and Ruth encouraged him to move on to his own work. Joe accepted a position as a nursing home administrator and therein found his niche. He thoroughly enjoyed the association with residents, other employees, and the satisfaction of working in a field that brought needed assistance and comfort to residents and their families. In due time he began to talk to his folks about what a desirable work it would be for them to enter into. Clyde considered all aspects of such a change and decided that the nursing home business was exactly the right one for the family. The dream: the plan: three nursing homes. One would be located in Tecumseh, OK, one in Shawnee, OK, and one in Guin, AL. When Marion Sunset Manor opened its doors there were already eighteen residents to greet the public. The original staff consisted of one RN, three LPNs, nine nurses’’ aides and three cooks. Jeanne Vines, RN, a cousin to Don and Joe, became the first Director of Nurses, and was very instrumental in establishing the attitude and standards of care. Marion Sunset Manor was leased by Stan and Dianna until January 1995 at which time the facility was purchased by Sunset Care, Inc., owned by Stan and Dianna and became, Sunset Manor. 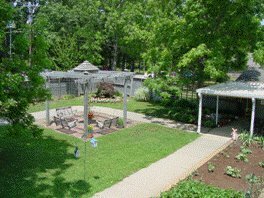 In 1999, Sunset Courtyard was created at the front west wing to allow free unrestricted access to the outside while providing security and allowing residents, family, friends, and staff the opportunity to enjoy God’s creation. In 2000, efforts began on the first major addition to Sunset Manor with the addition of a 7200 sq. ft. east wing allowing the addition of 10 residents, conference room, therapeutic bath, lobby, nurses station, and beauty shop. The west wing was extended for activity and dietary space and the kitchen and laundry were expanded. The addition was opened in June of 2001. As a result of the untimely death of our resident services director for six years, Cathy Ballard, and her unrivaled love and service to our residents, the courtyard was re-named Cathy’s Courtyard. Lance and Christie Junkin purchased Sunset Manor in 2004. They both share in the administration of Sunset Manor as they continue the tradition of caring.